The PROTOCOL lighting control system simply consists of two main components the PSFxx control stations and the PD Series Dimmer and Switch Modules. 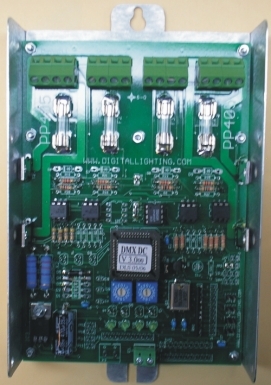 PD Series DIMMER Modules could be controlled from a computer / PC or integrated with other Audio Visual or lighting Control systems through the RAU-96 interface. 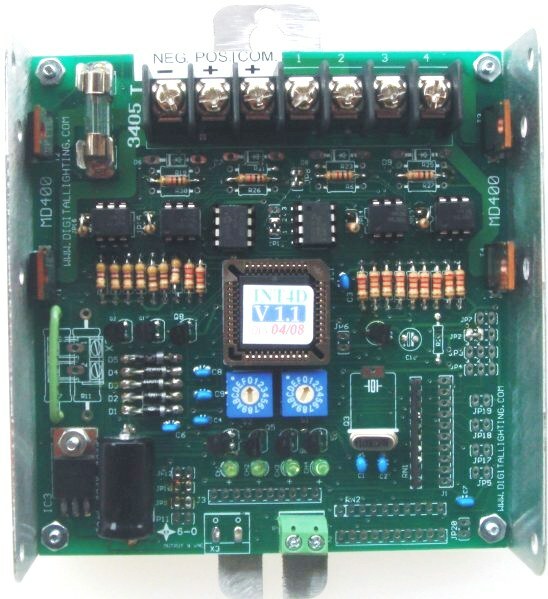 Each PD Series Module has a built in processor, Memory and self contained power supply. The PD Series Modules communicate directly with the Protocol wall stations using only one twisted pair of DATA wires from the system low voltage 4-wire bus. The PD Dimmers come in compact surface mountable aluminum enclosures and can be distributed to convenient locations near the electrical panels or close to their loads to minimize line-voltage wire runs. Switch packs have a hardware lock for non dimming loads only with features and specifications similar to the Dimmer packs without the RFI filters. PROTOCOL dimmers and control stations could be interconnected through wireless RS485 links. Automatic 60 / 50 Hz frequency detection. Self contained dimmers with distributed Processing in each unit. 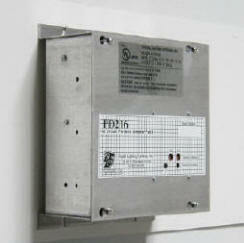 Outputs could be used as Dimmers and Switches combined in same module. Each Dimmer has 254 Preset scenes stored in nonvolatile memory in PDxxx modules. Individual output Min and Max trim adjustment. Convenient front panel LED output monitors. Compact size ; walll mountable. PD216;PD408,PD804 dim: 11.75" H x 8.30" W x 4.12" D .
PD404 dim : 11.50" H x 4.60 W x 3.30" D.
Durable aluminum wall-mount enclosure specially engineered for heat dissipation..
Also available in 220/240VAC, 24VAC & 12VAC. Aluminum OPEN U FRAME : Dim: 5.40" x 4.40" x 1.60"
Input: 10 Amps maximum from constant voltage power supply ; Operating Voltage range 6 VDC to 24 VDC . Outputs: 4 x 2.5 A. PULSE WIDTH MODULATED ( PWM ) MOSFET dimmers or switches. Positive Common. PULSE WIDTH MODULATION ( PWM) is used for constant voltage LED lighting and DC Voltage Lighting dimmers. Outputs: 4 x 5 Amps. PULSE WIDTH MODULATED ( PWM ) MOSFET dimmers or switches. Positive Common. 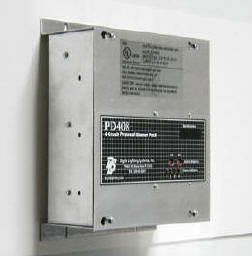 PP405 allows the use of 4 separate power supplies one for each output for Class 2 rated loads. Aluminum OPEN U FRAME : Dim: 7.50" x 4.40" x 1.60"
The PP405 is available in a PD405 UL listed PROTOCOL dimmer pack. The PD405 includes a PP405 module inside an enclosure with pre wired RJ45 data bus in and out connectors compatible with other PDxxx PROTOCOL dimmer and switch packs..
Dim: 11.2" x 4.6" x 3.3"
PD Dimmer and Switch Packs interconnect using standard network cables ( CAT 5, Brown pair used only ) available everywhere. Simply use the 3 foot network cable supplied with each PD unit to daisy chain to the next PD or to connect to the system's data and power hub DB44. Click here for more details. call us to find the best solution for dimming systems, dimmers repairs, dimmers upgrade, dimmers retrofit and dimming systems general service and maintenance alternatives.